Ernest Harsch worked on African issues for more than two decades at the United Nations and is currently an adjunct associate professor at Columbia University. His most recent book is Thomas Sankara: An African Revolutionary (Ohio University Press, 2014). 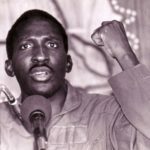 Nearly thirty years after his assassination, African revolutionary Thomas Sankara is still inspiring the struggle for self-determination.